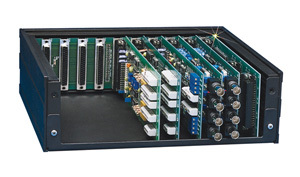 The OMB-DBK41 analog expansion module allows OMEGA’s OMB-LOGBOOK and OMB-DAQBOARD-2000 Series data acquisition systems to be expanded with any combination of up to ten OMB-DBK series analog expansion cards. The OMB-DBK41’s metal enclosure features an analog backplane into which the OMB-DBK series expansion cards can be easily installed. a OMB-LOGBOOK and a notebook PC on top of it. OMB-DBK series analog cards housed within the OMB-DBK41 can obtain their power from your OMB-LOGBOOK or OMB-DAQBOARD-2000 Series internal power supply, or the OMB-CDK10 battery and power supply module. However, depending on the combination and number of cards installed within the unit, the OMB-DBK32A or OMB-DBK33 optional power supply card may sometimes be required for adequate power. The OMB-DBK32A or OMB-DBK33 can obtain its power from a number of sources: an included AC adapter, an optional OMB-DBK30A rechargeable battery/excitation module, OMB-DBK34 battery/UPS module, or any 9 to 20 Vdc source, such as an automobile battery. You can stack the OMB-DBK41 beneath an OMB-LOGBOOK portable data acquisition module via included fastener panels, which are available with an optional screw-in handle. The result is a compact and securely connected data acquisition system that you can conveniently carry from one application site to another.